Born Pretty Store really are after our hearts with their own brand of stamping plates. Yes, I know I have said this before but look at how much of a bargain these plates are and then look at the quality of the plates. The images are crisp, the designs are fab and varied and the plates have a backing. I am yet to find a plate with any imperfections. In my opinion, the Born Pretty plates are really fighting for their place up next to all the larger more expensive brands in the stamping plate market. OK, my gushing is done. 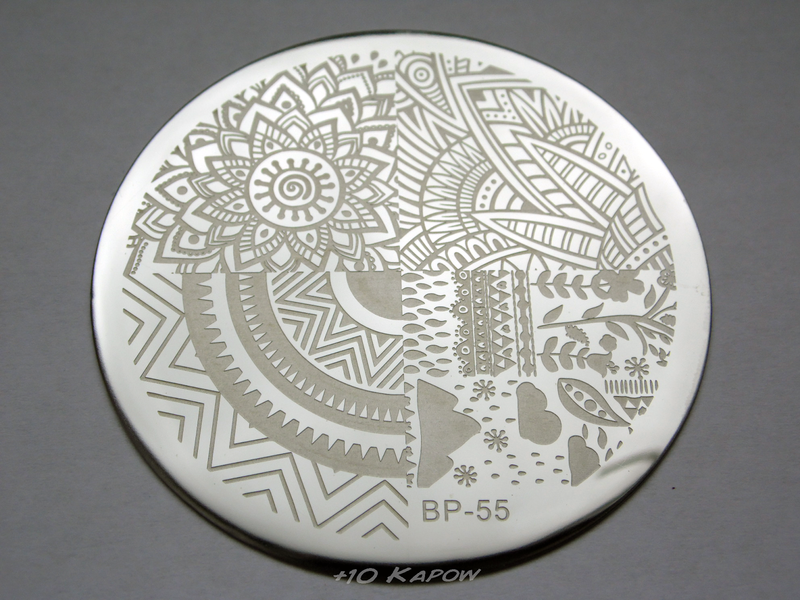 So as you can see, I have the Born Pretty BP-55 stamping plate today. First up a did a bright, reverse stamping design that was pretty on par with the perfect weather we have been having here in the UK over the last few days, don't worry, it won't last, the apocalypse is not approaching, we will likely return to the rain and gloom we normally have within a few days. I used a base of Barry M Cotton, then made 3 stamp 'decals' which I filled in using Barry M BLE 2013 Yellow and Barry M Mattes Copacabana, Rhosilli, Malibu, and Cancun. I applied one decal to the thumb and then cut the other 2 in half to fit the other 4 nails and topped it all off with a coat of Seche. 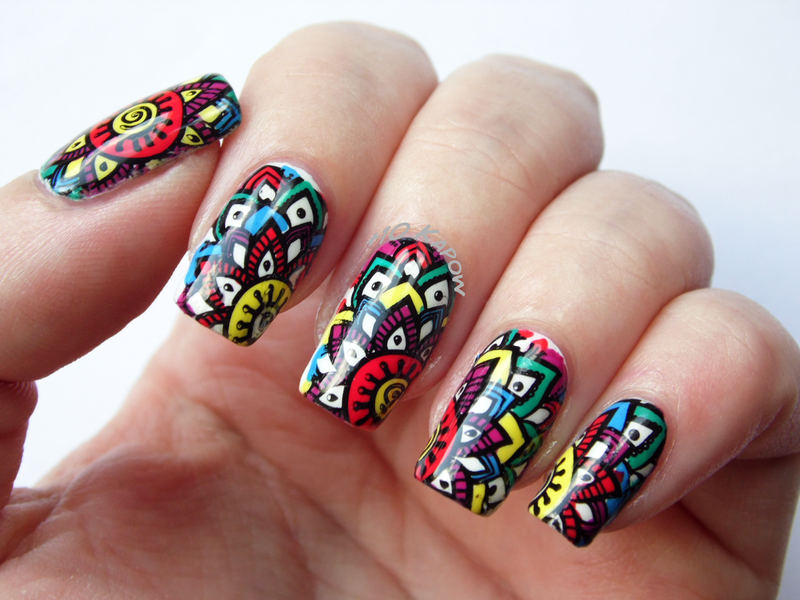 I think this design and the other one to the right of it on the plate are perfect for this kind of bright reverse stamping nail art and is a great way to add a bit of colour to what could be an otherwise flat mani. I then thought that maybe I should do a normal stamp mani with this plate to show that they are indeed capable (as am I, sometimes!) of doing regular stamping. And so this mani happened. The base colour is the always gorgeous Freckles Polish The Seven Wonders and I stamped using Models Own Cerise. 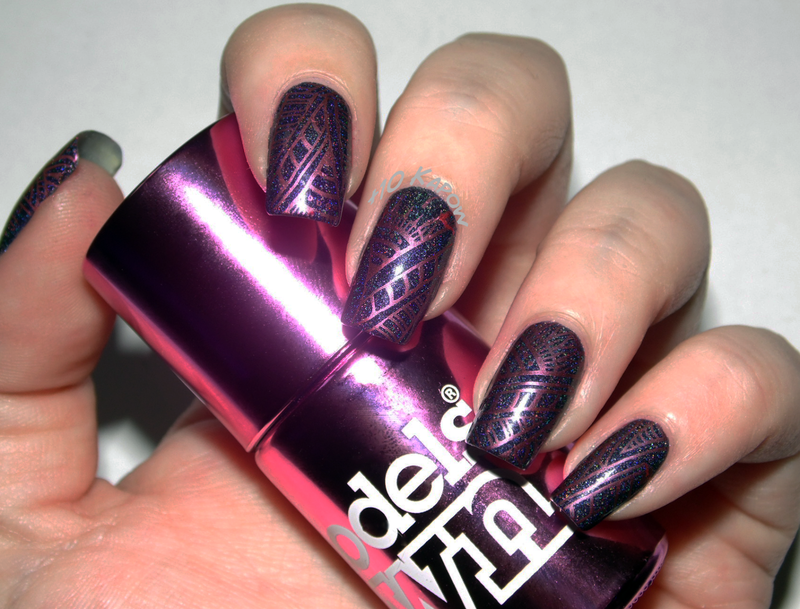 This stamp turned out looking super geometric and because it was late evening, I took this photo under the flash of the camera and so the holo was showing through the stamp, making this my favourite mani of April so far. It's simple but pretty. 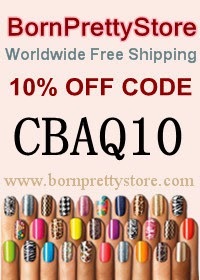 You can find this plate here for £1.33 ($1.99) and of course, don't forget to use my discount code CBAQ10 for 10% off your entire basket amount! Are you all having an awesome Easter Holiday/Half Term Break/April so far? The stamping plate in this post was sent to me for review purposes, All opinions expressed are my own, honest opinion!